The Daily Dimwit: Another Rainbow of Biggio! 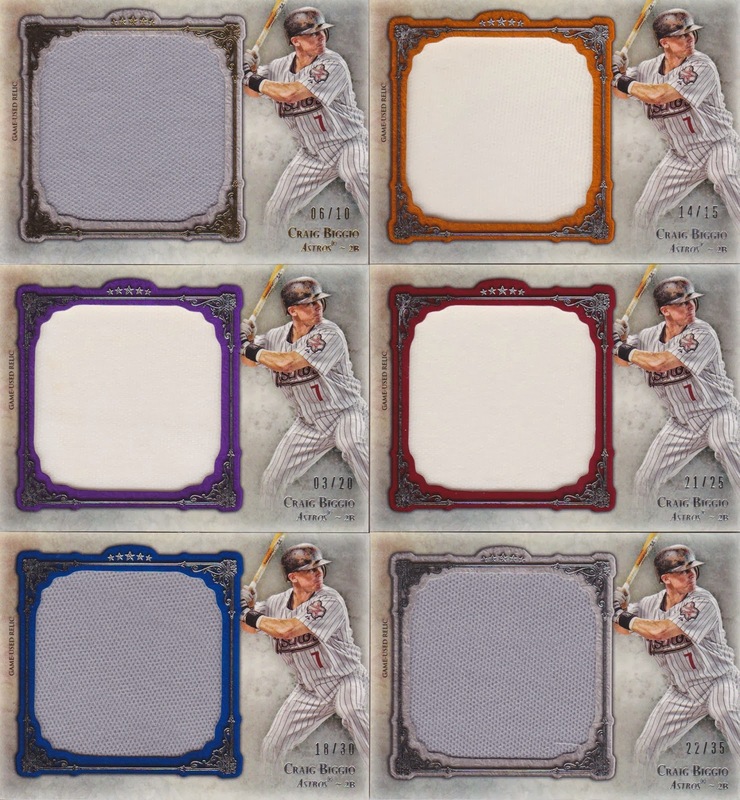 When I saw that Topps was putting Craig Biggio in 2013 Topps Five Star, I knew I was in trouble. Not because I was going to buy a bunch of boxes, but rather because I knew my eBay activity would spike! I have managed to pick up a nice lot of Biggio Five Star cards! Today, I show off the relic rainbow (missing a couple) that I've cobbled together! Wow! How about that! That's all the base relics from /35 through /10! The only two I'm missing are the "Rainbow /5" and the Jumbo Patch 1/1! It would be pretty sweet to add those two, but I'm pretty happy with these 6 as is! It is a bit odd to me that they used two different color jersey/pants for these cards, and that the picture is a pinstriped uniform. I am guessing they don't coordinate the relics/pictures at all and if that they match it's by pure coincidence, but that's the level of detail I would look for if I was running a company. Just my two cents. 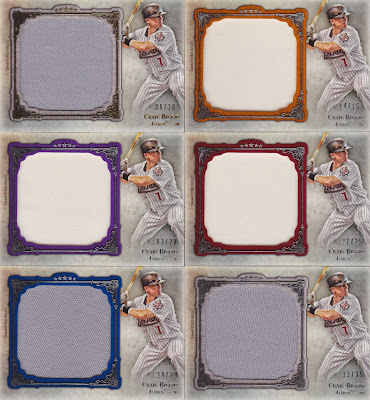 Coming soon, some Biggio autographs from Five Star! I totally agree with your two cents. I wish Topps quality control team would kick it up a notch. The 6 cards together like that look great! I too wish that all card companies would have the picture on the card match the jersey piece. It just makes sense!